Since my last update of a Patton's Best playthrough, I've been hearing a lot about a video game called Armoured Commander. AC is basically a PC version of Patton's Best with some interesting little differences. The game was apparently built using a programming language called Python along with a library called libtcod. Since I am currently in the middle of learning Python, this captured my interest and I found an entire community of developers building their own indie games out there and doing some pretty fantastic work. Pretty inspiring to see people out there building this kind of stuff. Way back in December 2014, I wrote an AAR based on a play of Avalon Hill's 1987 classic Patton's Best, designed by Bruce C. Shelley (one of the designers of B-17 Queen of the Skies, who would later go on to even bigger things with computer games like Civilization and Age of Empires). Here it is if you want to go read it. We left off with the crew of "The Spring Chicken" having just finished their first day of fighting in France at the start of the Operation Cobra breakout. After an exciting start to the liberation of France, the crew was hoping for a little R & R but the 4th Armored Division is very busy these days and the crew reports for a briefing in the cool pre-dawn summer air on July 28th. 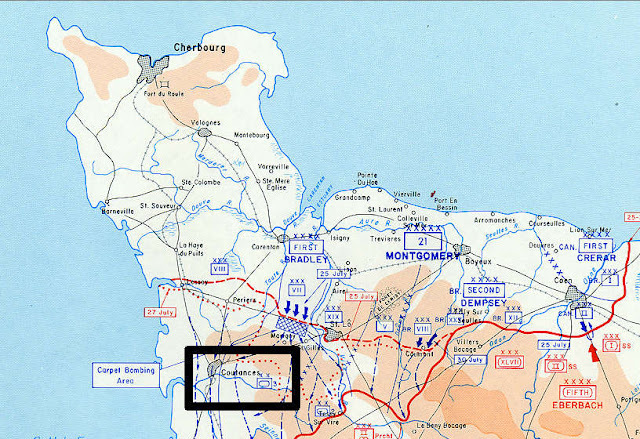 The Spring Chicken will be part of a task force advancing on Coutances, a town in northern France.